If you make homemade fresh pasta, making Asian egg noodles is easy. However, if you have never made pasta, making egg noodles is a lot simpler than you might think. 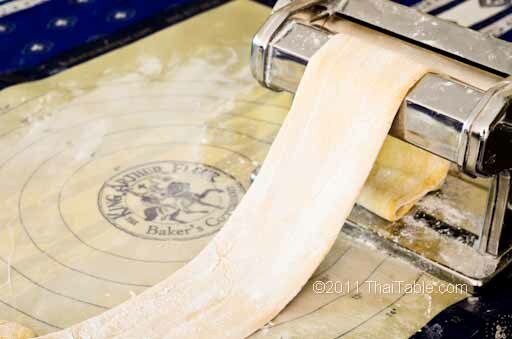 Making fresh noodles is a 2-step process, making dough and turning dough into noodles. I rely on my pasta bike that I bought 15 years ago from the North End, an Italian neighborhood in Boston. 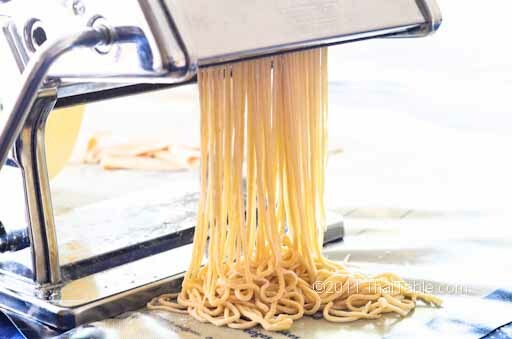 Like most pasta machines, it has a stainless steel body that rolls the dough into a thin sheet and an attachment that cuts the sheet into strands. It comes with a hand crank, a table clamp and a few other small pasta tools. The pasta machine was a good investment for me; I have made both Asian noodles and Italian pasta for years. Down the line, if you have kids coming to your house, it's another fun project to make pasta together. The baking soda gives the noodles the al dente mouthfeel. The NY Times had a good article on the properties and reactions of baking soda in food. 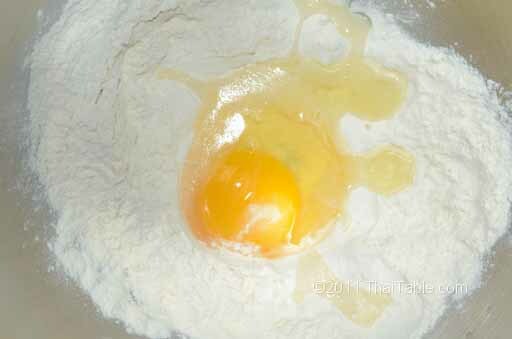 Mix all purpose flour, egg, salt and baking soda together either by hand or by machine. You want a soft enough dough to roll out but not too soft. You may need to add a tablespoon or 2 of water to bring the dough together. 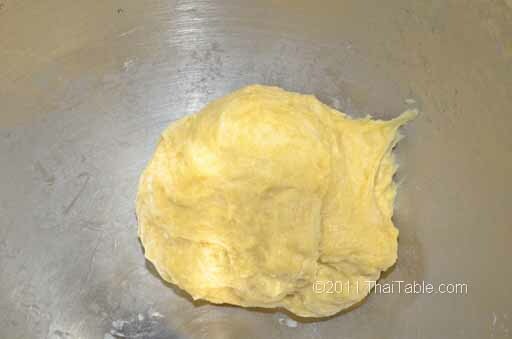 Softer dough has more water and may need more flour to bring the dough back into balance. Kneading the dough should not take more than 5 minutes. 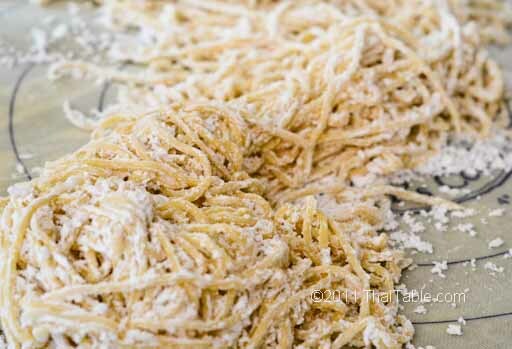 When the dough is well mixed, let it rest while you prepare the pasta machine. I line my table with a silicon pasty mat. Later, we'll use the tapioca flour to keep the noodles from sticking. You can make the noodles with either a machine or by hand. I use a machine because it's faster and easier. 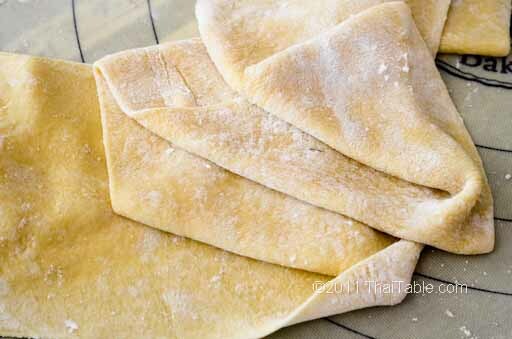 Roll the dough out into a long shape to fit into the pasta machine. Dust with the tapioca flour to keep the dough from sticking. On the machine, turn the knob to 1 for the first roll. Fold the dough back on itself and put the dough through the pasta machine again. Repeat the process a few times until the sheet looks smooth. Sprinkle some tapioca flour on the sheet before each roll. Crank up the knob to larger numbers and roll out the sheet until you get to number 6 or 7. Stop at 6, if you like thick and rounder noodles. At numbers 6 and 7, the noodles are just the right size to make the small strand Asian egg noodles. Attach the noodle cutter to the pasta machine. Use a small strand cutter for egg noodles with barbeque pork and larger strand cutter or kow soi, a northern Thai noodle dish. The noodles can be made using rolling pin, too. Divide the dough into half. Roll each one separately. Sprinkle tapioca flour to prevent noodles from sticking. When you get the desired thickness, between 1/8 – 1/10 of an inch, roll the sheet up like a roll of gift wrapping paper. Slice the the roll into 1/8 of an inch wide cuts. Toss and seperate the cut noodles while sprinkling some tapioca flour on them. Cook your homemade fresh egg noodles for egg noodles with barbeque pork.